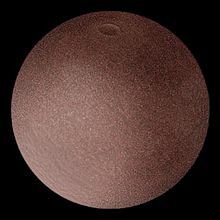 Makemake (officially known as 136472 Makemake) is a dwarf planet. It was discovered on March 31, 2005 by astronomers Michael E. Brown, Chad Trujillo and David Rabinowitz. It was announced as a dwarf planet on June 11, 2008, and the discovery of a moon was announced on April 26, 2016. Makemake is a Trans-Neptunian object, because it orbits the Sun further out than Neptune. Originally the object was given a codename 'Easterbunny' as it was discovered shortly after Easter. The International Astronomical Union gave it the name Makemake, the creator god of the ancient Easter Island people, to keep its connection with Easter. Makemake appears to be made mainly of ice and rock. However, at its very low temperature, ice is as hard as many types of rock. In 2016, it was discovered that Makemake has a small moon. Makemake's moon does not yet have a name. Instead, astronomers call it "S/2015 (136472) 1". Its orbital period around Makemake is more than 12 days. The moon is about 175 kilometers across. ↑ "Planets, whats in a name?". ↑ Parker, Alex Harrison, et al. "Taking The Measure of Makemake's Moon." AAS/Division for Planetary Sciences Meeting Abstracts. Vol. 48. 2016. This page was last changed on 21 April 2017, at 07:21.